IDC organizes and hosts a variety of workcamps, events, and workshops. These activities are in line with our goal to promote sustainable development, intercultural awareness, international mobility, and ecological engagement. This year we organised and hosted a summer workcamp on eco-building in our camping grounds. The aim of this project was to learn how to create a round eco-building inspired the ideas of Evelyne Adam. 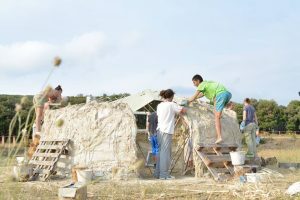 The participants used natural materials such as lime, clay and hemp. There were 17 participants from all over the world, with different ages and from varying backgrounds. Click here to learn more about this workcamp and see the images. 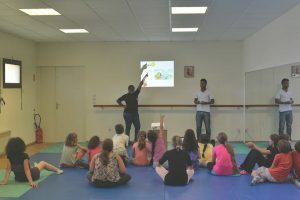 In May until June, our volunteers organised some cultural activities in the school in Villegailhenc, a village near the campsite. They had a great time with the children and shared some smiles and laughters. English was the primary mode of communication and they did creative activities to promote learning and exchange. Marcio and Jothi shared a little of their culture and music with the children. Read more about this activity here. Annually, IDC participates in a 13th Century Medieval Weekend in the Camping de Lastours Le Belvédère. Overlooking the four medieval castles of Lastours, this is the perfect place to immerse oneself in the atmosphere of the époque and learn more about the history of the area. 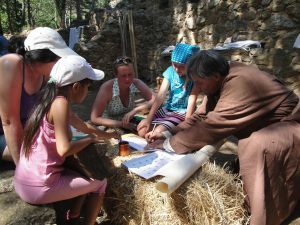 There are different types of activities open for adults and children alike. The weekend features a medieval buffet showing an array of traditional foods of the area and the century.